There was a post about the coolest application for the iPhone: Car Performance Meter for IPhone. Guys from Garage419 took Dynolicious out on the track and put it against the circuit's clock as well as the popular G-Tech Pro accelerometer-based dynometer, generally regarded as the industry standard for consumer performance metering (about $150). Surprisingly, at less than one tenth of the G-Tech Pro's retail price, Dynolicious was more accurate. Watch the video, forgive them for some commertial inside. This patent is for accessing your entire iTunes library from anywhere—streamed to your iPhone or touch either via Wi-Fi or EDGE/3G. Basically, this future iTunes will sync the metadata for your whole library, and all the music and videos stored back on your computer ("virtual media items") will be totally integrated with the content actually on your device, so it'd be just like having your entire library on your phone. Negative feedback on 2.0.1. Update bricking some iPhones. Here is some negative feedback on 2.0.1. A small number of blog readers and Apple-support forum participants have reported the update bricked their handsets or killed Wi-Fi functionality. Didn't show up during testing by many labs. There are several reports that updating to 2.0.1 on an iPhone in Airplane mode may result in bricked phones. Users who paid Vodaphone to unlock their phones for international roaming have reported the update breaks connections with their carriers. A few users report occasional lag in the Contacts, SMS and e-mail apps. From our testing, typing in the Contacts app is still laggy, but SMS and e-mail is faster. No surprise whatsoever: Updating results in losing access to your jailbroken (i.e. hacked) apps. 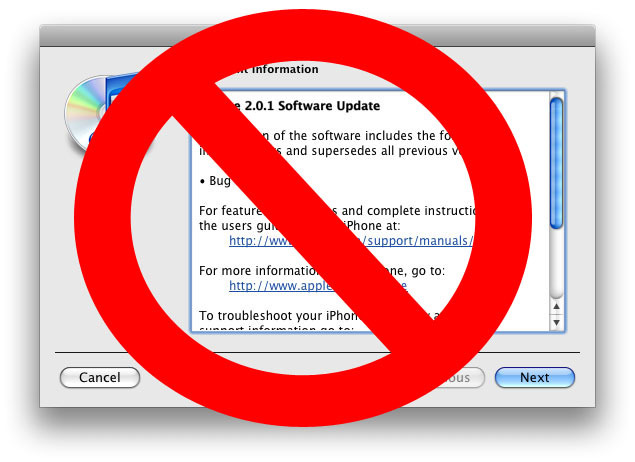 2.0.1 updates iPhone 3G's baseband, you may never be able to unlock the handset again if you run this update. Many users are reporting 2.0.1 is slow with backup. This more likely has to do with the version of iTunes they're running; many have said iTunes 7.7.1 sped up backup and syncing. Installing 2.0.1. Solving problems. Avoid bricked phone. The 2.0.8b new EDGE method worked great for about 1/2 the people and not at all for the other 1/2. I have added a config option to decide which method to use. It defaults to new. Reverted the way the 5 restricted apps and bossprefs get hidden to the older method where they become unhidden on updates. The 5 restricted apps did not work when launched from another app or system protocol like HTML page call. And double tap home for bossprefs was broken when it was hidden. This should work now. On every update, bossprefs will be unhidden, however. Sorry, no fix to this. Added IP address to 3g line and fixed edge/3g IP address issue. In 2.0 the network device is renamed. 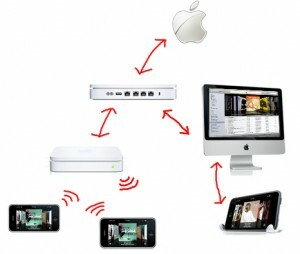 Qik has released its mobile video streaming application for jailbroken iPhones to the public. The service allows users to broadcast video live from their phones using Wi-Fi or the EDGE network which can be viewed on Qik’s site or through its embeddable player. Unfortunately, the application is only compatible with phones running the 1.1.4 firmware. Users running the 2.0 version of the software will need to wait for Qik to release a compatible version, which the company expects to do in the near future. Unfortunately, it’s likely that the application won’t be available through the official App Store, as Apple still hasn’t enabled video capture using the phone’s integrated camera. There are many solutions like battery packs and rechargeable hip holsters for iPhone and iPhone 3G. 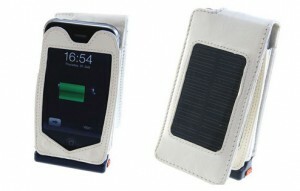 However, the new case from Mobile Fun has one advantage over all of these other devices—it can be charged by the sun. The case itself features a sizable 1500mAh battery pack that they claim can be charged by the sun in as little as three hours. It also has a mini USB to USB cable that allows you to charge from your PC or hook up other gadgets for a quick shot of sweet solar juice. 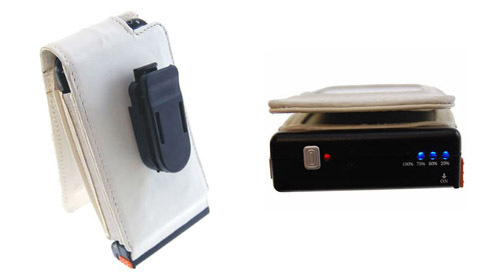 The case is slated for release in August in both black and white versions for around $54. Colorware: many colors are avaliable. Costs: $150 for back panel, $20 for frame, $20 for button, $10 for Sim card tray, $10 for earburds and $20 for dock. 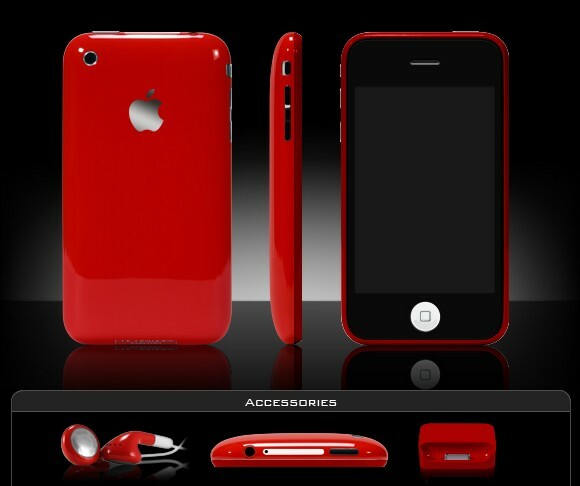 $230 for everything, but iPhone will look nice. You can play with different colors on their web site. NPD Group released the top leading music retailers for the first half of 2008. 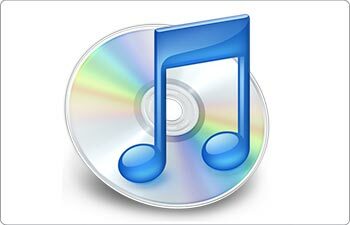 The list was based on purchases of CDs or digital music downloads. Apple's iTunes remains number one among all retailers. Apple took the number one spot in April, overtaking Wal-Mart. 28 April 2003 : start in the US. 5 May 2003 : one million is sold. 23 June 2003 : 5 million. 8 September 2003 : 10 million. 15 December 2003 : 25 million. 15 March 2004 : 50 million. 15 June 2004 : iTunes in France, UK, Germany. 12 July 2004 : 100 million! 26 October : in all European Union. 2 December : iTunes in Canada. 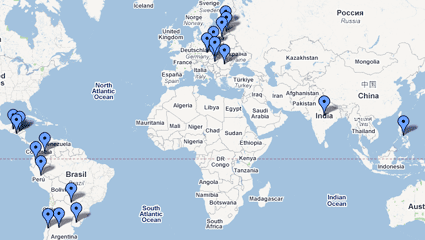 10 May 2005 : 400 million, open in Denmark, Norway, Sweden, Switzerland. 17 July 2005 : 500 million! 4 August 2005 : Japan. 25 October 2005 : Australia. 23 February 2006 : first billion! 19 June 2008 : 5 billion! Fortunately, you can disable Airplane mode from the emergency screen if your iPhone is put into an inactivated state by a problematic update. Winterboard is amazing. Saurik, the developer of Winterboard, has just added dynamic backgrounds. Your background can now be an HTML web page using webkit. The possibilities are endless. He threw together a small theme called “Saurik” that fades in and out between two images as an example. But so much more can be done with this. So, while staring at the desktop, I realized “wait, why don’t I make that a website? then you could do all kinds of neat things with it!”. This dream has been made a reality with the latest version of WinterBoard. There is a new file you can add called Wallpaper.html which puts a UIWebDocumentView behind SpringBoard. Quake filannly made it! It is avaliable in Cydia Installer. Main thing, it’s quite playable - moving around and firing are easy to do. There is an Options area, sound and music, and very little lag when playing. 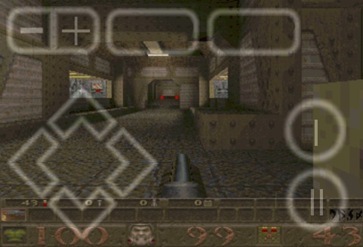 It doesn’t make use of the accelerometer - but if you’re a Quake fan, this is a good bit of Sunday fun for sure. It is similar to the previous one. Same idea. The slim chip-and-circuit gizmo hugs the rear of your SIM and messes with the signals that go between it and the iPhone (or, indeed, a large number of other GSM and 3G phones) in a way that unlocks the device. Brando's product still requires you to cut your SIM to make room for the chip aboard it, but it looks a fairly simple operation. Costs just $21.